Yearbooks from eleven different Stanly County schools are now available on DigitalNC.org. They come to us from the Stanly County Museum in Albemarle. 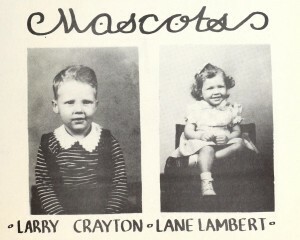 Senior class mascots from Ridgcrest High School’s The Fledgling, 1948. The Stanly County Museum has shared a large number of items through DigitalNC. They can be viewed here. Last September, we added issues of The Wake Forest Student dating from 1882-1891 to DigitalNC. Additional issues are now available, dating 1892-1900. 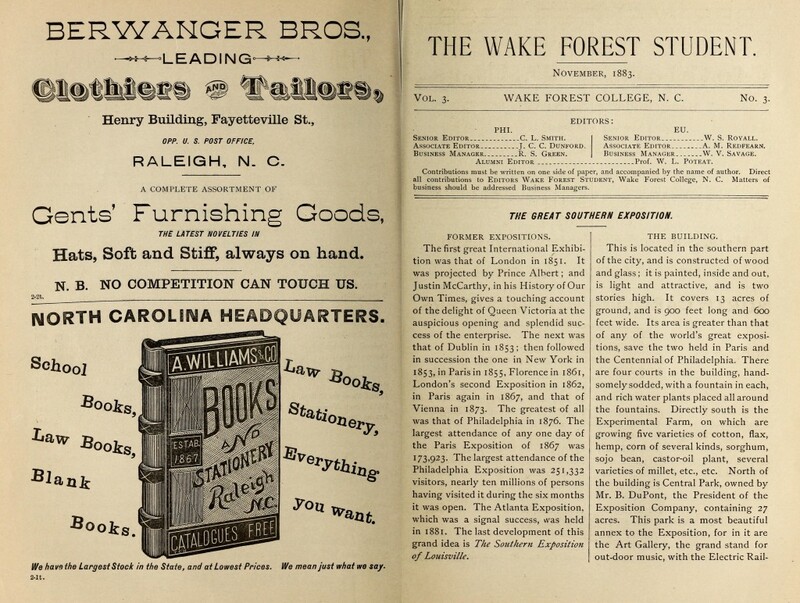 The Wake Forest Student was a literary magazine at Wake Forest University published by the Euzelian Society. As with earlier issues, the Student‘s contents include essays by local authors, reprints of well-known stories and poems, an editorial section that includes both traditional editorials as well as college and state news, and a section for alumni to provide updates on their activities and lives. The literary magazine still exists as Three to Four Ounces, which is published twice per year by Wake Forest University students. You can also view yearbooks, catalogs, and commencement programs from Wake Forest University on DigitalNC. Collage of the covers of the recently digitized Henderson Junior Woman’s Club scrapbooks (not to scale). Clockwise from upper left: JWC (Junior Woman’s Club) 1989, JWC 1978, JWC 1991, JWC 1974, Week of the Young Child (1979-1986), JWC 1993, JWC 1952, JWC 1975, Bicentennial Trees (1977). 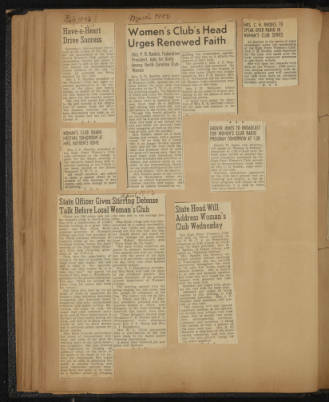 The recently digitized scrapbooks from Perry Memorial Library capture both the activities of the Henderson Junior Woman’s Club and the distinct personalities of the women who created them. Each of the nine scrapbooks has its own quirks, whether it’s the Vance County Bookmobile carved into the wooden cover of the 1952 volume, the delightful illustrations in volumes 1974 and 1975, the entirely Charlie Brown-themed 1978 volume, or the lovely needlepoint scene adorning the cover of the 1989 volume. It is clear that many painstaking hours went into crafting these informative and artistic records of club activities and achievements. Page from Vance County Week of the Young Child Scrapbook. Most of the scrapbooks document the community service work and fundraising the club did over the previous year; they also contain information on clubwomen. 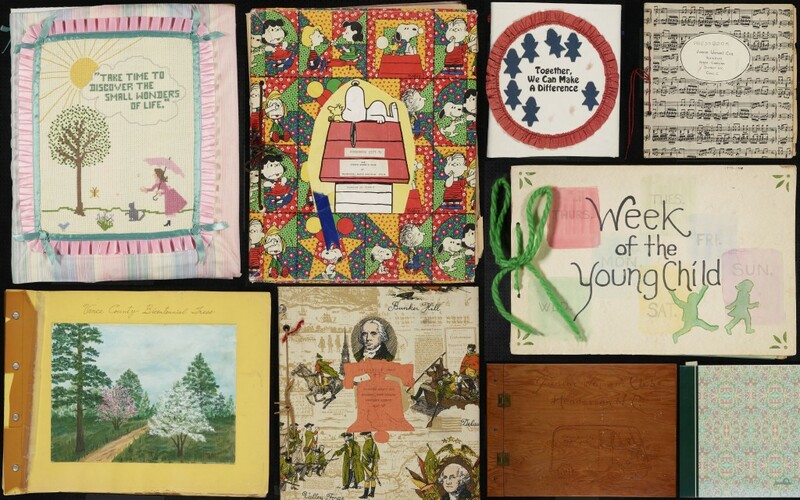 There are two scrapbooks devoted to special topics, however: the Vance County Bicentennial Trees Book and the Vance County Week of the Young Child Scrapbook. The Bicentennial Trees Book was made by the Vance County Bicentennial Commission, whose goal was to plant 1776 trees in Vance County to celebrate the 200th anniversary of the founding of the United States. It documents the trees that were planted as part of this project. The second specialized volume, the Vance County Week of the Young Child scrapbook, chronicles the eponymous annual event during 1979-1986. Sponsored by the National Association for the Education of Young Children, the celebration was first established in 1971 and continues annually in April. Its purpose is to celebrate young children and teachers, families, and programs while affirming the importance of early childhood (defined as birth through age 8). The scrapbook contains photographs, newspaper clippings, and other memorabilia from the celebrations in Vance County. To view all of the scrapbooks from Perry Memorial Library, click here. More materials from the Stanly County Museum have now been digitized and posted online at DigitalNC. Most of the material that has been added in this batch comes from the Dr. Francis Joseph Kron Collection. There are a number of papers and letters concerning the many legal battles that the Kron family were involved in, mostly concerning rights to land and contesting wills. Later letters display Dr. Kron’s frustrations with the unceasing attacks, in one declaring that North Carolina is a “vast lunatic asylum” for allowing these suits. 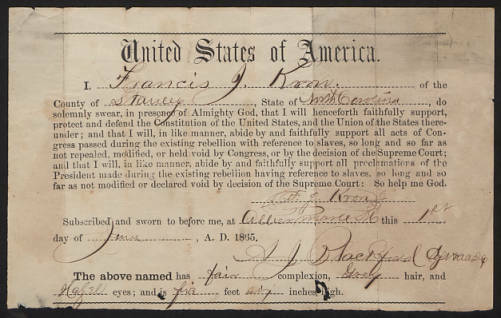 Also included in this batch are a number of miscellaneous letters from the Kron family, including the former slaves of Elizabeth and Adele Kron who kept the surname Kron, and a variety of legal documents including birth certificates for some of the members of the Kron family who were born in Europe, and statements of allegiance to the United States. For more information on the Dr. Francis Joseph Kron Collection, see the exhibit website, or this previous blog post. Unrelated to the Kron papers but also provided by Stanly County Museum are three panoramic photographs. Two of these photographs feature factory workers. The third is a photo that was taken at the 1912 Young Women’s Christian Association Conference, and it includes representatives from a number of women’s colleges. All of the Stanly County Museum materials available on DigitalNC can be viewed here. 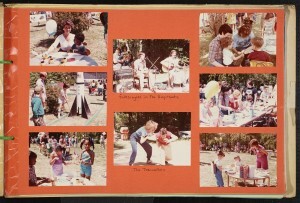 New scrapbooks from the High Point Women’s Club have been added to DigitalNC. These four books cover the years 1940 to 1942, 1953 to 1954, 1955 to 1956, and 1956 to 1957. They show the range of activities that the women’s club participated in, including attending national conventions of women’s clubs, having guest speakers from various levels of government and academia, hosting fund raisers for the Red Cross and March of Dimes, and their annual talent show, among other things. The scrapbook that covers the years 1940 to 1942 pays particular attention to World War II and issues that affected the home front. The women’s club was very involved with learning and educating others about home defense and action to help the war effort. They also had a number of activities meant to help the soldiers who were overseas. Page concerning public defense and keeping faith in troubled times of war. The High Point Women’s Club was a division of the North Carolina Federation of Women’s Clubs as well as the General Federation of Women’s Clubs. The North Carolina Division is now known as the North Carolina General Federation of Women’s Clubs, and for more information you can visit their website. 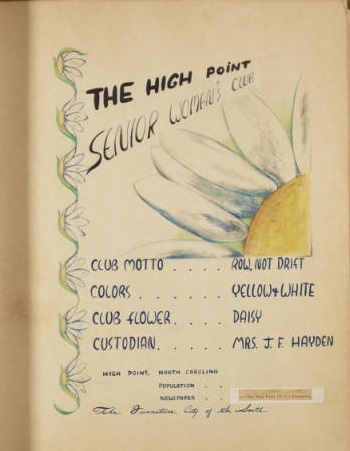 The High Point Club is still in operation to this day. These scrapbooks were contributed to DigitalNC by the High Point Museum. 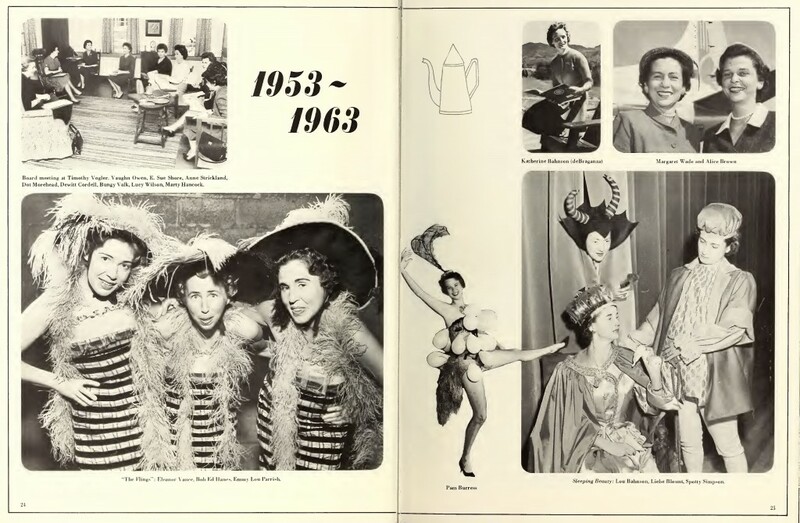 Also digitized with these materials were two William Penn High School yearbooks from the Heritage Research Center at High Point Public Library, years 1957 and 1958. To see more materials from the museum, visit their contributor page. To browse more Heritage Research Center materials, visit their page here. To browse more yearbooks, visit our North Carolina Yearbooks collection. Four new titles from the High Point Museum have been added to the North Carolina Newspapers collection. Three of these titles are from area companies, and they join a number of other papers on our site that document not only local businesses but also the communities and families involved with those businesses. These three titles document employee milestones, both inside and outside of the company, as well as new products, company events, and production goals. They all have a lot of photographs and employee names. On occasion, national news would touch these publications, as in this October 1960 issue of the Amco News which describes the Nixon-Kennedy debate. Amco News was produced by the Adams-Millis Corporation, at one point the fourth largest hosiery manufacturer in the world. This paper has several regular columns, like “Aunt Matilda’s Corner,” which gives general household advice, and “News Around the Plants,” which would later become “Overheard” and talks about graduations, illnesses, and vacations. The Southern Historical Collection here in Wilson Library holds some of the company’s records. 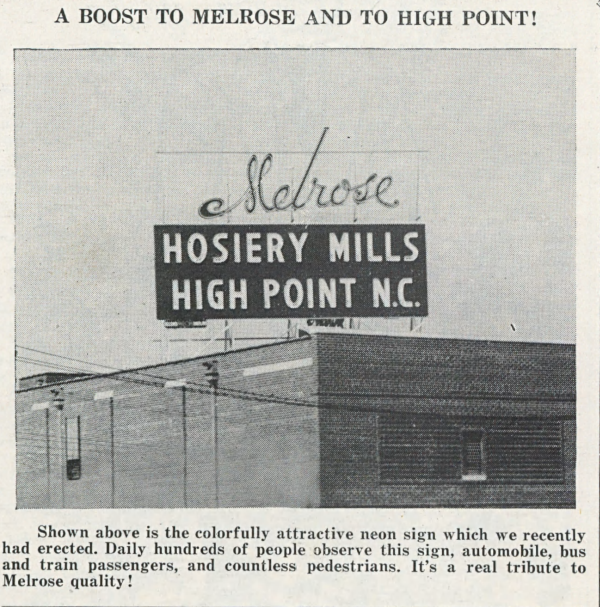 The Mel-Rose-Glen paper was “The Voice of Melrose and Glenn Mills,” two hosiery mills in the High Point area. This paper includes a good bit of anecdotes and advice, but also more locally-specific news and some fantastic photographs. The cleverly named Sew It Seams was produced by the Anvil Brand company, which manufactured casual clothing. Like the two titles above, it is also full of departmental and product news. Members of the Anvil staff and their families are frequently shown modeling the company’s latest line. The fourth title added from the Museum, entitled What’s Happening, was a short-lived publication of the High Point Model City Commission. According to the High Point Enterprise newspaper from November 2, 1968, Model Cities was a five-year program “designed to concentrate all available public and private resources in the community in a comprehensive attack on the social, economic and physical problems of the Model City Area.” (via newspapers.com, paywall). What’s Happening describes the program’s successes and challenges. It also documents local events, like this Halloween party at a local preschool. You can view all of the materials contributed from the High Point Museum on DigitalNC here. Women’s history features prominently in newly digitized items from Forsyth County Public Library. The materials come from four groups: the American Association of University Women, the Winston-Salem Junior Woman’s Club, the Junior League of Winston-Salem, and the League of Women Voters of Winston-Salem Forsyth County. Though similarly named, each of the four groups operated with distinct objectives and activities. These materials from the Winston-Salem chapter of the AAUW date from 1948 to 2006. They cover the history and manifold activities of the branch since its founding in 1914. The items — including newsletters, by-laws, meeting minutes, membership directories, reports, brochures, and photographs–document the AAUW’s work to promote the equality and success of women in North Carolina. 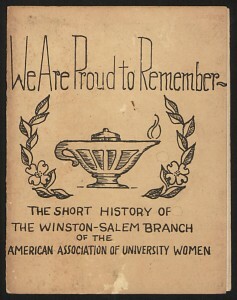 Of particular note is the History of the North Carolina State Division American Association of University Women, 1927-1947, compiled and written by Carrie B. Wilson, club historian. Although the report primarily focuses on the history of the organization on a state level, it does include brief notes on the individual chapters that preceded the state division. In 1923, the Junior League of Winston-Salem became the first North Carolina chapter of the Association of Junior Leagues of America. The women of the organization devoted themselves to improving the lives of women and families through voluntarism of all types. Their efforts are documented in the annual reports, newsletters, brochures, and programs from performances and events; these digitized materials date from 1923 through 1996. The 50th and 60th anniversary editions of the chapter’s newsletters in particular are great resources for anyone interested in the League’s activities and early Winston-Salem history. Over forty years of bulletins (1952-1992) comprise the bulk of these materials. The newsletters document the various political, social, educational, and local issues of concern to League members over the years. Also included is hand-drawn sheet music and lyrics for a club song called We Are The League and information from the group’s annual meetings. To browse all materials from Forsyth County Public Library, including photographs from early Winston-Salem African American schools, please click here. Four new scrapbooks have been digitized and uploaded from the Wayne County Public Library. 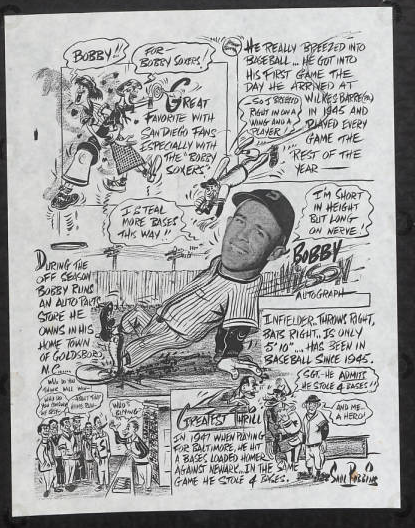 These scrapbooks follow the career of Bobby Wilson (full name Robert Monroe Wilson) as he played baseball for three baseball teams, the Wilkes-Barre Barons (in 1945 and 1946), the Baltimore Orioles, and the San Diego Padres. Although he played baseball around the country, Bobby Wilson was born in Goldsboro, North Carolina. He played second base and shortstop, and many newspaper clippings discuss Wilson’s speed and his ability to steal bases. As seen in the image above, his base running skills occasionally played a big role in his team’s performance. For more information on Wilson’s baseball career and statistics, visit this website. The Wayne County Public Library has contributed a number of other scrapbooks pertaining to baseball and local baseball players. To browse all of the material Wayne County Public Library has contributed, you can visit their contributor’s page. Forsyth County Public Library recently contributed two collections of materials relating to African-American schools in the Winston-Salem area. 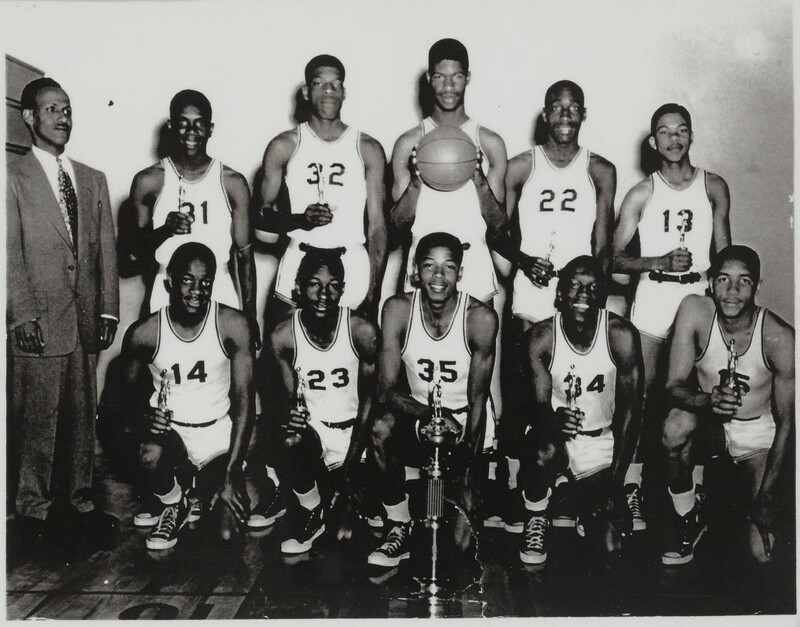 Atkins High School basketball team, 1951-1952. 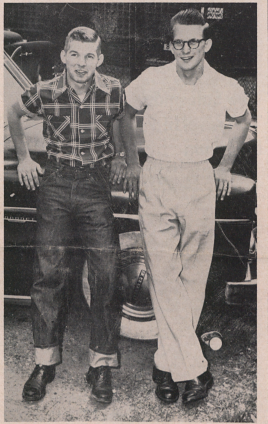 It was the first of the school’s three consecutive state championship wins (1951-1952, 1952-1953, and 1953-1954). These photographs provide a rare view of early African American high schools in Winston-Salem. The first school, Columbia Heights (also known as Columbian Heights) Colored Grade School, began as a three-room building in Winston-Salem around 1905. In 1913 it was enlarged, and in 1917 Columbia Heights Grade and High School became the second high school for black students in Winston-Salem. In 1922 and again in 1929, the booming school was renovated and expanded. Still it was too small, and in 1931 the high school students moved to the brand-new Atkins High School (so named for the principal of Columbia Heights, Simon Atkins). The Digital Heritage Center has digitized the last two class portraits from Columbia Heights High School before students moved to Atkins High School, as well as photographs from Atkins High School, 1932-1965. For more African-American school history in Winston-Salem (including more on the historic context of black education in the South), see the National Register of Historic Places document for Atkins High School. The Memorial Industrial School was one of only two black orphanages in North Carolina. The Colored Baptist Orphanage Home, as it was known, opened in 1906 to serve homeless children in the Belview area of Winston-Salem, though it moved eight miles north in 1928. It operated until 1971, providing students with academic as well as agricultural and domestic education. DigitalNC now hosts materials dating from 1926-1964 that document the history of the school and its pupils, including commencement programs and annual reports. Some of the richest information comes from the applications to the Orphan Section of the Duke Endowment. These requests include lists of boards of directors, demographic information of the children living at the orphanage, facility and library information, education, and other information. The school’s campus, situated on 425 acres, was also funded by The Duke Endowment as well as by the local Reynolds and Gray families. Also useful are the floor plans and blueprints of parts of the school, mostly dating from an auction sale. 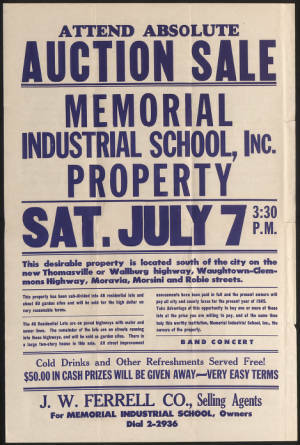 The Forsyth Historic County Resources Commission has more information on the history of the Memorial Industrial School. To browse all materials from Forsyth County Public Library, including newly digitized materials from Winston-Salem Women’s clubs, please click here.